We’d love your help. Let us know what’s wrong with this preview of Deadly Sweet Lies by Erica Cameron. Every night for the past two years, the Balasura have visited her dreams, enticing her to enter their world. And every night she’s seen through their lies. Now, they’re tired of playing in the shadows and they begin to stalk her in the waking world. It’s no longer just an invitation; if Nadette doesn’t join them, they’ll take her fami Nadette Lawson knows when you’re lying. To ask other readers questions about Deadly Sweet Lies, please sign up. Is this the last books of the Dream War Saga? This was an okay sequel, and I liked catching up with the characters from book 1. Nadette had a pretty useful ability in this book in knowing when people were telling lies, and Julian had the interesting ability that he was able to make people believe lies! The storyline in this was once again about defeating the demons who plagued kids dreams, and specifically about getting Nadette away from the demons who wanted her. I did like that the characters from book 1 made a cameo, but the pace was a little bit on the slow side for me. There was some romance, although it was a sweet girl-girl romance. The ending to this was a little surprising, and we did get an interesting twist! Perhaps it is a case of 'it isn't the book, it's me', but I can't keep myself to be interested with this fey-related YA novel. The teenage MCs, although I'm glad to see lesbian MC and asexual MC in YA, still they don't keep me interested. So, dropped. Every time someone lies, Nadette has a bell ring inside her head. For the past two years, Balasura have been trying to convince Nadette to stay in her dreams, stay in their world. They want her ability, but her ability allows her to see through their lies. Now they're tired of waiting and will force her into submission by threatening her family and torturing her during waking hours. On the other side of the country, Julian lives with a mother who couldn't care less about him and an ability to lie. Every night, Julian sees his best friend, Orane in his dreams. Then Orane dies and Julian finds out that his best friend was a Balasura and was actually evil. Julian doesn't want to believe, but now there's someone else being targeted and he has to help her get to safety. After the end of Sing Sweet Nightingale, I was expecting this book to follow the same characters. Instead we get two new characters and a new story. Interestingly, it still feels like the story is being carried over. The characters in this book are connected to the ones in the last book and even the events are connected. It's actually a great way to continue the story! I liked both Nadette and Julian. I liked Nadette's strength. She doesn't have the strength that we associate with most YA girls, but the real kind. The kind where she has to go through something difficult and it able to do it, but also not perfect. She's human and she does break and few times, but she's still strong. I also love her attachment to her family and her family in general. She has a crazy, huge family and I just loved how they believed in Nadette and just never questioned her. Julian was a great character too. He would hate me by saying this, but I felt really bad for him. He has a bad family life, sure, but that's not the main reason. First of all, his best friend turned out to be evil and then throughout the book he just seemed confused and I really just wanted to shake him, so he would be able to see things more clearly. As for romance, there wasn't really much romance, but it was dealt with very well, especially when it came to Nadette (view spoiler)[I thought the add in of Julian being asexual was a bit awkward. I really like the fact that we're seeing an asexual character (since that's what I identify with), but it was just so conveniently explained that I felt it could have been added in a little bit differently. It made it sound so easy and it really isn't that easy to figure out what you identify as. (hide spoiler)]. It is very rare I don't finish books, and I do try to read all of them especially if I have requested them but I just could not go through with this book. I felt like this book was another Lair of Dreams which took me forever to read, it was a similar concept considering of another wordly but in the dream landscape, hero and heroine fighting the battle against evil. I must admit, I didn't notice this book was the second to a series as I had requested an arc via netgalley. But thankfully that didn't matter, because I didn't realize until halfway in and this book works just fine on its own! Now, the whole plot is extremely investing as why I really wanted to read this! I find the whole dream world to be super cool. I love my fantasy books! The different point of views for each chapter was a nice layout. I like how this book was easy to follow along and each P I must admit, I didn't notice this book was the second to a series as I had requested an arc via netgalley. But thankfully that didn't matter, because I didn't realize until halfway in and this book works just fine on its own! Now, the whole plot is extremely investing as why I really wanted to read this! I find the whole dream world to be super cool. I love my fantasy books! The different point of views for each chapter was a nice layout. I like how this book was easy to follow along and each POV corresponded with each other time wise. I received a free advanced e-book copy from Netgalley in exchange for an honest review. Deadly Sweet Lies is book 2 in the series. I liked this book with its many truths and lies, although at times I could sort of predict what might happen and I turned out to be right. Also, I think the ending of the book could have been better. Deadly Sweet Lies starts off about a week before Mari's birthday. We get two points of view throughout the entire novel, just like in the first one, which I think is great. Julian is visited by Orane, just like Mari, he believes that Orane is the best friend he never had. Nadette on the other hand is different, instead of going into the dreamworld and being seduced by Paradise, she tells every single one of them no. But, instead of giving up and just letting her live her life, the Balasura hunt Deadly Sweet Lies starts off about a week before Mari's birthday. We get two points of view throughout the entire novel, just like in the first one, which I think is great. Julian is visited by Orane, just like Mari, he believes that Orane is the best friend he never had. Nadette on the other hand is different, instead of going into the dreamworld and being seduced by Paradise, she tells every single one of them no. But, instead of giving up and just letting her live her life, the Balasura hunt her and try to weaken her resolve. The main reason they want her is because they want to collect her gift of being able to tell when someone is lying. Which I think is a pretty cool skill to have, she would make a great police detective. I just read book 1 recently, so I remembered the events that took place on Mari’s birthday, which also had a big impact on Julian (since he was being used by Orane) and Nadette (I guess because she is special and we need to connect her somehow). It was interesting to see another perspective on the same event that happened 100's of miles away! After Orane never shows back up, Julian is told that Orane was using him for his power of deception by another Balasura who claims to be on the side of good. For someone who is exceptionally well at lying, I thought he would be able to see the lies that the new Balasura in his life was telling. Especially after he was given a necklace that tells you when something isn't what you think it is. I figured out the plot twist as soon as the new Balasura came in the picture. Nadette Lawson knows when you're lying. Every night for the past two years, the Balasura have visited her dreams, enticing her to enter their world. And every night she's seen through their lies. Now, they're tired of playing in the shadows and they begin to stalk her in the waking world. It's no longer just an invitation; if Nadette doesn't join them, they'll take her family. Forever. She needs help, and the haven she's seeking may be just out of reach. Julian Teagan is a master of deception. To survive, he has to convince the world his mother isn't useless, that everything's fine, otherwise he'll lose what little he has left in this life. He knows the lying won't be enough to keep him and his mother in the shadows, but it's all he knows. The only light of truth is Orane, a Balasura who sees past Julian's facade and challenges him to face the darkness. Then Orane is killed, and Julian learns his mentor was far from innocent. The Balasura have hunted children like him for centuries, and their next target, Nadette is his one chance at finally being a part of something real. If Julian can just convince her to trust him. That said, the story was okay. A bit slow in places and certainly could have used a better ending (although I gather there was going to be a Book 3) but it was alright. The characters of Nadette and Julian were the highlight for me - well written and interesting, always finding out something new about them as they developed as characters. I do enjoy character development! This review has been hidden because it contains spoilers. To view it, click here. Confession: I actually didn't know this book was the second in a series until I'd downloaded it. I requested it on Netgalley because 1) the cover is very pretty and 2) the description made me oooh. Luckily, Deadly Sweet Lies works just fine as a standalone novel, so I was able to jump right in without feeling like I'd missed anything. Which was great. Sinatra bless it, where do I start with this one? I loved, loved, loved the idea of there being a dream world which targets and deceives kids with Confession: I actually didn't know this book was the second in a series until I'd downloaded it. I requested it on Netgalley because 1) the cover is very pretty and 2) the description made me oooh. Luckily, Deadly Sweet Lies works just fine as a standalone novel, so I was able to jump right in without feeling like I'd missed anything. Which was great. Sinatra bless it, where do I start with this one? I loved, loved, loved the idea of there being a dream world which targets and deceives kids with supernatural abilities in an effort to use them for evil. It was something I'd not read before. I thought the alternating POVs between Julian and Nadette and watching them face their individual tormentors was interesting. When their stories began to come together, I was really excited. And then I was a little let down. But let's talk about our main characters. Nadette can tell when someone is lying (even if they believe they're telling the truth) and can't lie herself. Julian is (apparently) a master of deception, and is the only person who can successfully lie to Nadette. Both of them have been targeted by a sinister group of beings called the Balasura, which are visionary figures appearing in (and sometimes out of) the dreams of those with special powers, tricking and enticing them to join their realm. Julian is visited by one of these figures called Pheodora who says she wants to help, and she points him in the direction of Nadette. The two soon meet and head off to a secret safe haven called Abra, where we are introduced to a clan of misfits much like Julian and Nadette - those in hiding from the Balasura and the rest of the world. Heck yeah, I was thinking. Let's go team! Band together and fight the common enemy! They talk. They argue. They talk some more. They discuss the Balasura. Julian's cousin and her boyfriend arrive. They argue some more. Nadette's family comes to visit. They talk. Yeah. For about 80 pages of this book, nothing happens. Well, things happen, but nothing that interested me or even contributed much to the plot. There was a lot of telling rather than showing. I wanted to see more of these kids' powers. I wanted to see them tone and sharpen their abilities. I wanted them to form a plan, set a goal and work toward it. Julian and Vasha fight and make up. Some girl paints a mural and it's beautiful. There's a lot of glowing and sparkling and wandering around and wow I got bored. Julian is supposed to be a master of deceit, but we never really see him put his ability to use (besides playing poker and lying to his uncle). He even mentions at one point how he feels inferior to the others because of how minuscule his 'power' is... and I have to agree. There is romance in this book, which disappointed me, because for a good while it seemed like there wasn't going to be. It's not that I'm against a good love story; it's just that, in this particular instance, I really didn't think it necessary. It felt like there was enough going on without it and it sort of distracted from the main issue. Julian thinks he has a crush on Nadette and kisses her, only to find out that she's gay. Nadette then immediately gets together with Lexi (who she's liked from the moment they met). In spite of the fact that we never had reason to believe that Lexi felt the same about Nadette (or girls in general), they kiss and all is well. Okay. What really struck me as strange, though, was the conversation between Julian and Beth, in which Beth helps Julian to determine that he is, in fact, asexual, after telling him all about the asexual spectrum. While this was cool and nice (seeing as I'm asexual myself, I love reading about characters like me), it felt like the story was put on halt just so the author could take a moment and preach about sexuality... especially since it's never mentioned again. I could be wrong, but I got a real "This is my chance to educate" vibe from this passage. The action finally picks up again in the last two chapters of the book, and we're left with Julian and Nadette trapped in the realm of the Balasura. Which really irritated me, because if the entire third quarter of the book had been set there, it would have been a much more exciting read. I'm not sure if I want to look into the third book or not. It seems like things could pick up, and I do really love this plot idea. Plus, Johanna and Aisling are pretty cool characters, and I want to see what happens now that Aisling (gah, I love that name) is gone. The Okay, I have to be honest. I didn't know that this book was the second in a series. I requested this book from NetGalley and read it at once without knowing there's a book I'm supposed to read first called Sing Sweet Nightingale. But, even though that's what happened, I still understood the story and nothing confused me at all. Later, I found out this was because the two books are narrated by different narrators and there's a huge time gap in between the events of the books. ARC provided by NetGalley in exchange of an honest review. Many thanks to Spencer Hill Press for trusting me with the task! Terrible creatures named Balasura predate on young people with special powers to gain their trust and cultivate their abilities before taking them, leaving the user in eternal coma. Nadette has always been able to see through lies and thus she was never fooled, and suffered for that, being stalked inside her mind, receiving threatens to her whole family. Finally, she has a c ARC provided by NetGalley in exchange of an honest review. Many thanks to Spencer Hill Press for trusting me with the task! Terrible creatures named Balasura predate on young people with special powers to gain their trust and cultivate their abilities before taking them, leaving the user in eternal coma. Nadette has always been able to see through lies and thus she was never fooled, and suffered for that, being stalked inside her mind, receiving threatens to her whole family. Finally, she has a chance to escape and find refuge with a community of victims just like her. On her way, she meets Julian. He has the ability to convince people, and is the first person who is able to lie to Nadette. Until recently, Julian had considered the balasura his mentor but now he is gone and a new one has appeared, revealing his mentor's true nature and asking him to help Nadette be safe from her pursuers. Can Julian really help when it seems the safe community is at the verge of an invasion? This is the second book in the dream war saga and I should start by noting I haven't read the first part. I considered also requesting it on Netgalley but the summary for this one sounded so much more interesting, I wouldn't have had the patience for the first anyway. The story is narrated in alternate first-person-POV of Julian and Nadette, who come from such different places but are united by the balasura element. I think the style is my greatest complaint. I can see how it is difficult for an author to give voice to narrators but I can't remember a book giving me such headache as this one when it came to keeping track of who was telling the story. Except for when Julian would say something related to Sinatra, I would have to go a few pages back to make sure who it was or else I forgot. About rhythm, I can't complain. Being the middle book of a trilogy is the hardest thing, it's all about anticipation while anything will only happen in the last page. Maybe because the characters were different from the first, however, I didn't find it anything close to boring. The world she built was already enough to keep me turning pages. Many characters participate here and it can be a rain of names but it was easy to get to know the main players and even to relate to them. This is not exactly dark. The themes are, and there was room for a lot of drama but after the beginning, when I was afraid all that desperation both from Nadette and Julian would suffocate me, the mood improves considerably and we get to enjoy a very good time despite the impending doom. Plot-wise, I think it was predictable to a point I crossed my fingers to be wrong. I'm not sure I can say there was much character development but there is a lot of room for that in the last piece. The climax happens right before the ending, so we'll only know the consequences in the sequence. This can be read without the first part but it isn't a stand alone. The book mentions a battle and the whole story prepares you for it but it should only take place in the future release. Also, there are many mysteries I would love to know the solution, so I do want to read the next one. Even though it was more of an average reading, it was entertaining and I should say I appreciated the characters. didn't fall in love with any of the main ones, I reckon my favorite is Aisling, the one recruiting all the people in the community. I should say I recommend the story but with a warning this is nothing new and nothing too memorable. However, the book is still good. Not being big on fantasy, I'm always wary of this type of story—it can derail pretty badly. This one didn't let me down even for a moment. To s Nadette Lawson knows when you’re lying. The timeline of Deadly Sweet Lies overlaps with that of Sing Sweet Nightingale, and a lot of events happening result from there. So, I had to do a little skimming through the previous one (my faulty memory) to get a feel of the characters again. This book focuses on Nadette and Julian, the two teens mentioned in the climax of the previous to have run away from their respective homes. Both are on the run from the Balasura, towards a safe haven in New York. Julian has the ability of deception and Nadette can spot a lie, so it is interesting in how their friendship develops. Julian has been sent to aid her to get to the safe haven, which when they reach turns out to be not that welcoming. The people there are all quite young, living in fear of any attack, and the appearance of these two sets them on edge. Slowly, however, they learn to become a family, which is definitely what Julian needed after his horrible childhood - taking care of an alcoholic mother, and growing up to take care of the house. Nadette, meanwhile, has always been a little different, and is a bit lonely because of it. The writing, however, failed a bit in making their voices distinct; they sounded the same, and at times I had to backtrack to see who was the narrator. This book gets point for diversity in sexuality, with a gay and an asexual character given importance with respects to romance. The friendships that Julian develops are also a beautiful thing, because he never had the chance to do so before. Mariella and Hudson both make an appearance towards the end and play some part in moving the plot along. The ending, however, was a bit abrupt. It seemed unnatural, and rushed, but overall, the book was good. I don’t even know where to start so I apologise in advance if my review descends in to fangirl speak at times and nothing else. Okay confession, I was so caught up in what I was reading I can’t remember anything except thinking “Oh my God, Oh my God, Oh my God I need to read faster!” that’s how on the edge of my seat I was. I never really got the phrase breathless with anticipation until now, because I was breathless with anticipation. I literally forgot to breath at times (don’t worry it was only for a few seconds! Until I realised I was holding my breath) because of what I had just read and anticipating what would happen next. There’s SO MUCH I want to talk about but everything I want to talk about could be classed as some type of spoiler and that’s what I don’t want to do – spoil the book for you, because part of the reason I enjoyed the book as much as I did was because of all the plot twists and “Oh, That’s why that was mentioned before!” moments I discovered as I read through the book (and you’ve got to admit the discovering unexpected twists is half the fun right? ), I want everyone to have that same feeling if/when they read the book. Something I will mention though is the diversity in this book! If you actively seek out and buy books because of their diverse content then this book is for you. I won’t mention a specific scene or instance because like I said before I feel that would technically be seen as a spoiler, but there is a part of the book that talks about (and explains) asexuality and demi-sexuality. Personally, I had heard of the terms and had been meaning to look up what they meant so thank you Erica for explaining those to me. 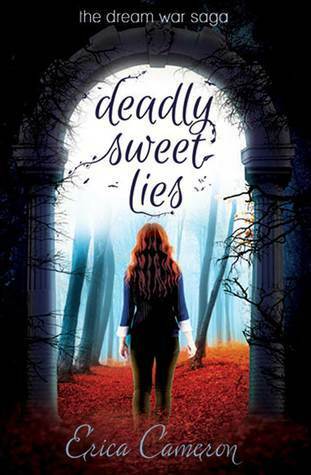 I think Deadly Sweet Lies was even better than Sing Sweet Nightingale (and if you were following me in 2014 you know how much I loved that book). Nadette was a pretty strong character for Deadly Sweet Lies wasn't half as good as its predecessor, in my opinion. The characters were kind of weak, and the little bit of world-building still wasn't sufficient, in my opinion. The writing was pretty good, but the pacing was super slow. It just didn't hold my interest as well as Sing Sweet Nightingale. I did enjoy seeing what happened to the characters of the first book, but the ending of this one really freaking sucked. I just wasn't blown away. I received this book from Netgalley and made the mistake of reading it without diving into book one first. Although it wasn't too hard to get into the plot and understand what was going on, it took a bit for me to connect to the characters--something I'm sure would have been no problem if I would have started this series from the beginning. The first pages were a little confusing. The first, short scene was grabbing, but then it dives into a dream world, and I was lost for a moment. But this was I received this book from Netgalley and made the mistake of reading it without diving into book one first. Although it wasn't too hard to get into the plot and understand what was going on, it took a bit for me to connect to the characters--something I'm sure would have been no problem if I would have started this series from the beginning. The first pages were a little confusing. The first, short scene was grabbing, but then it dives into a dream world, and I was lost for a moment. But this was my own fault as mentioned above. The characters, Nadette and Julian, are up against demons which haunt dreams. Nadette is their target, but unlike many victims before her, she's not easily fooled and doesn't give in. Her uncanny ability to tell when someone is lying fits wonderfully with her personality and makes for several great moments. It was easy to like her and understand the choices she made. Julian is determined to help Nadette, but he's not the perfect hero. In unison with Nadette's power, Julian can make people believe lies. Of course, this doesn't work so well on Nadette. This creates an interesting background and calls for obvious problems as he tries to convince her that he wants to help. The world and set up are interesting, and after the first pages, I had little trouble falling into the story. The only problem really was the pace. It's a bit slow and dragged at times. . .which is dangerous for a reader like me who is easily distracted. But it dives into thoughts and emotions, and is perfect for those who like a calmer pace. All in all, it's a solid read with a lot of good things despite a few hang-ups now and then. I'd give it 3.5 stars but am rounding up. Two runaways. Two stories. One safe haven. The war that began (for us anyway) in Dream Wars #1 snakes out to Julian in Nevada and Nadette in Florida chasing them together in an attempt to survive the wrath of the dream world demons. Chasing them until their stories collide briefly with Mariella’s and Hudon’s towards the end syncing them together. Despite a few nicks and tid-bits here and there, dang, I still found this book entertaining, fast-paced, and a bundle of great paranormal fiction. If you read the first book and enjoyed it then you’re gonna love this one and it ends with a big cliff-hanger that will keep you panting until Cameron writes what will happen next. But (side note) in my personal opinion I think you’d have to be a definite paranormal fiction fan to really get into this book or this series at all. When I requested this book I had no idea it was second in a series. I didn't even realize it until I came to write this review. Now that I do know, the characters from book one make much more sense now. The dream world was easy to envision and it really captured me! By the end I was really hoping there would be a little more, but unfortunately I have to wait for the next books release. I'm very curious to learn more about some of the people we didn't get much information about. There were some When I requested this book I had no idea it was second in a series. I didn't even realize it until I came to write this review. Now that I do know, the characters from book one make much more sense now. The dream world was easy to envision and it really captured me! By the end I was really hoping there would be a little more, but unfortunately I have to wait for the next books release. I'm very curious to learn more about some of the people we didn't get much information about. There were some points in the story that I felt were pretty predictable, or not as surprising as it seemed they were meant to be. Wow what a fantastic read I really enjoyed reading this book.it was an amazing adventure I just lost myself in the book for hours it felt like I was walking along side the characters in the book. I truly recommend this book to anyone and everyone who wants a book to get lost in.thank you for letting me read and review your wonderful story it was an honour and I will definitely be on the look out for more books from this author. I LOVED the first book in this series, but I'm finding it hard to connect with the characters in this one. I may go back to it later, but haven't been able to read through it just yet. Would still read more from the author, this one just isn't working for me. No rating. A great sequel, I must say. I enjoyed the new POVs to the story, they were quite well-written, they were easy to differentiate. The plot was interesting, I love fast paced novels. With only few moments that I disliked, this was a great read. i really liked book 1 in this series and same with the second book. most importantly we get an asexual main character, which is so important! i almost screamed at that ending cuz ahhhhh well you'll have to see for yourself. and i need book 3 right away! Wonderful book! Page turner once you're in it, lots of actions you never get bored and amazing characters development! Can't wait for the next one!